Specific Levels of Significance that Every Trader Should Be Aware Of! Price Times Plus Displays them ALL from one Nicely put together package..
– ALL Plot Colors and Styles are Completely User Configurable! – ToolBar DropDown Icon for Simple & Easy User Selectable Options, Adjustments, and Configurations!. Quit Using Indicators that display different values on every chart! – Minor Code Tweaks for Increased Efficiency! – Suggestions Welcome! Video Demonstration and Detailed Explanation of All Features, Properties, and Configuration Coming Soon! 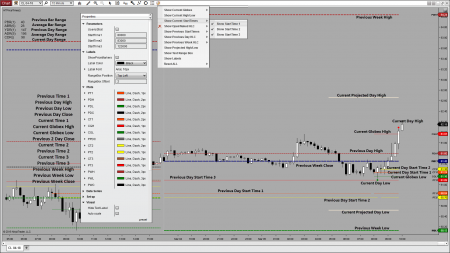 very useful and efficient tool for specific times the drop down menu makes this a must if this is used in your trading. I bought NT7 version of PriceTimes Plus some time ago, and now have also purchased NT8 version. Very helpful for trading planning levels and gaps. Nice and fast service without a doubt. Recommend this indicator to anyone who wants to be precise in levels. I work as a scalper, and it does fit the method. Thanks for the service!